One of mine and Leilani's favorite healthy or not so healthy( depending how we make it) snack is Greek yogurt with toppings. Greek yogurt is a healthy alternative to traditional yogurts because it has less sugar, less carbs, and more protein than traditional yogurt. Honey also has many health benefits. Like helping reduce cancer and heart disease risk and even helps with cough and sore throats too! So naturally one of our favorite filling, tasty, and healthy snacks is Greek yogurt-our way. 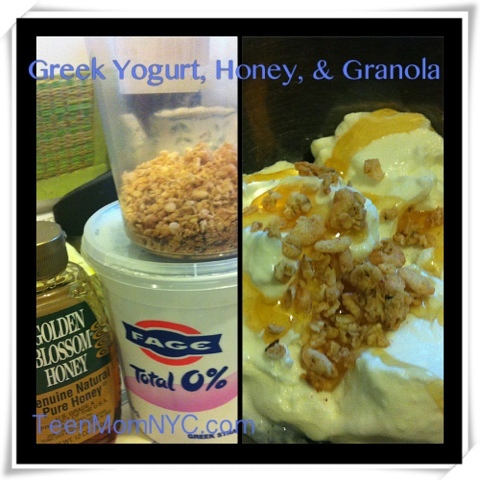 Start with a plain Greek yogurt, add honey and granola and voilà! You can also make it sweeter with adding dark chocolate chocolate chips, brown sugar, jellies, and dried fruits. Let me know how you and your family enjoy this snack!